I was in California for the Holidays and took a trip to San Francisco with my Family. 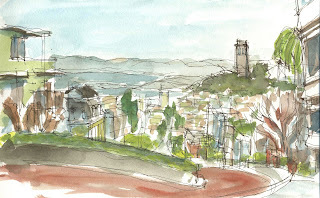 Here is a sketch from the top of Lombard street looking toward the Bay and Coit Tower and the entry to Ghirardelli Square. 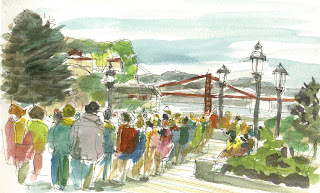 Final sketch was in line waiting for the Cable Car with the Golden Gate Bridge partially in view. 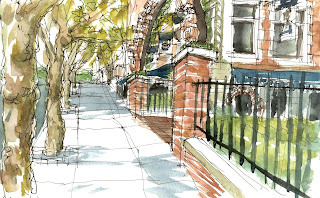 way to kick off the year with some great sketches Gail, i immediately recognized the view from Lombard Street since I've been there a few times, love SFO! Gail - great series of sketches. My wife and I stood in that line waiting for a cable car, I think we gave up and went next door to the Buena Vista for an Irish Coffee.